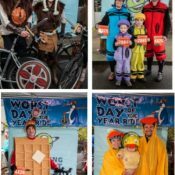 These riders in the 2011 Worst Day Ride might want to get those penguin costumes out again. 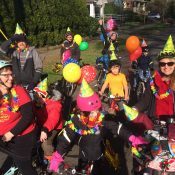 Organizers of the Worst Day of the Year Ride once again find themselves in an ironic situation. Due to a winter weather forecast that includes snow and ice, they’ve decided to postpone their event to a later date. 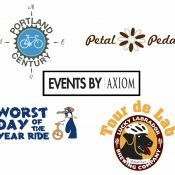 The 18th annual version of this classic Portland group ride was supposed to happen this Sunday the 10th. It will now take place on two Sundays later on February 24th. That is, of course, if the weather holds. Some of you might recall a similar situation during the big winter storm of 2014. Back then, facing a much more severe storm that dropped eight inches of snow and a sheet of ice on the ground, organizers first ditched one of the three routes due to safety concerns and ultimately cancelled the ride altogether. 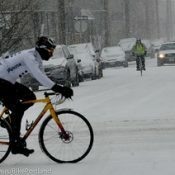 Not surprisingly, the announcement that a ride based on pedaling through the “worst” weather will be postponed because of the worst weather, has been met with varying amounts of ridicule online. “Last time this was cancelled, Minneapolis held theirs in deep snow and laughed,” wrote @shpeeds2 in response to our Twitter post about this yesterday. Events by Axiom has posted a FAQ related to the postponement. Riders who’ve paid the registration fee already can have it transferred to the new date, another ride on the company’s 2019 calendar, or the 2020 Worst Day Ride. With an estimated 3,000 people expected to show up to the event, it’s quite understandable they’d err on the side of caution. Ah, never mind. 2014 was the last cancelation. Best Day Of The Worst Part Of The Year ride. And here I was completely psyched to ride the long route on icy roads. I’ll never understand the upper-Midwest humblebrag attitude when it comes to ice/snow. Yes, I get it, you live in a tundra several months of the year and have adapted every aspect of your life so you can survive. Most people in the rest of the US don’t, so we aren’t prepared for this kind of weather. Bragging? Maybe. But folks who ride that way can relate to one another’s experiences, good or bad. I don’t see any humblebragging here. The worst day of the year ride, as the name would suggest, implies that the weather is going to be bad, maybe even dangerous if you’re not careful. So if that’s not up your alley, don’t go. Seems silly to me to cancel a ride for bad weather when the entire point of the ride is bad weather. There are many more organized rides year-round you can attend where you won’t feel personally attacked by people who enjoy cold/foul weather. Riding on ice (which is probably what we will have by the time Sunday rolls around) is just stupid, especially on public streets. This ride would never be cancelled for rain, just the snow/ice which is present 1% of the year on average. Not wanting to be the one who states the obvious here, but it’s basically just a fundraising ride with a cute name, and they can’t take risks for insurance purposes. I’m not sure I would call this a fundraising ride. It is an event run by a for profit company that puts on a variety of bike and run events. A “portion” of your entry fee goes to the Community Cycling Center. I don’t think the website explains what the details of that “portion”. $.010 or $10 is still a “portion”. I don’t have any problem with a company making money for providing a service and giving some money to a local non-profit like the Community Cycling Center but I’m always a bit skeptical when I see “portion”. It is a cool event and some of my family members have done the ride and had fun. “Production standards.” Reminded me that the event is as much about getting money as it is about riding bikes. 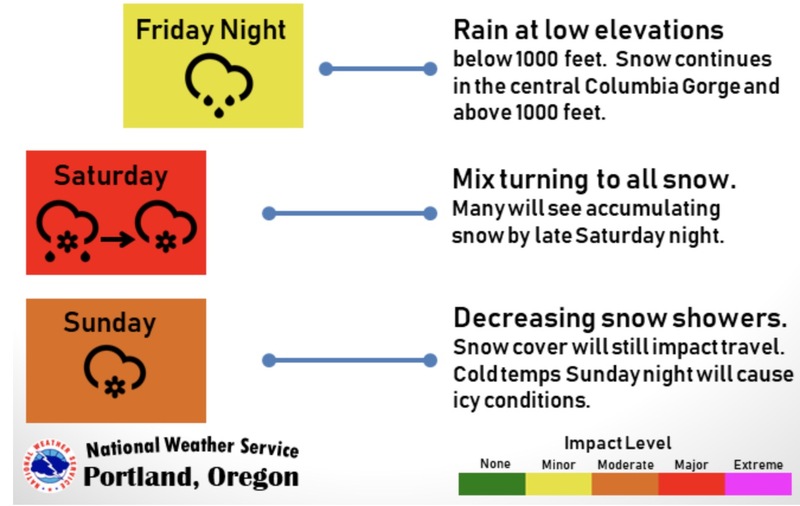 Isn’t it fair to say that at least half of America’s mainland gets more snow than Portland? (Obviously I’m not counting Alaska, which by the way is the only state with tundra). Anyway, it’s not just the upper Midwest, although we may have more bragging rights than most. Good thing I’m not from the upper-Midwest – just the mid-Midwest (Illinois). But I was kidding about the ice – I’m a support rider for the long route and was not looking forward to it. Geeeeeezus Portland! Change the name of your annual ride for crying out loud! Stop trying to market a ride as something that it is not nor is it intended to be! Maybe call it “Hey bikes are awesome, lets ride in February” ride. 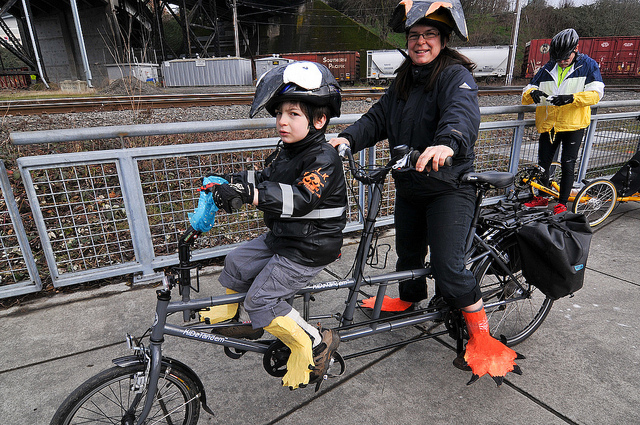 If you’re wondering how Portlandia gets started, ot’s exactly for reasons like this! Heck yeah I’ll be out there shattering my hip on Sunday whether Axiom likes it or not. Put a bird on THAT, Fred & Carrie! Same starting place an route as Axiom’s event, except free and you are responsible for attending, support and getting home safe. Stop paying these promotion companies for bicycle rides!!! Some people like the support and social aspects of the event. Maybe it should be called Worst Non-Freezing Day of the Year Ride. Plenty of Portlanders with humblebrag attitudes about how much it rains (even though we all know the amount of rain isn’t that much, it’s just a lot of the time), but forget that it usually snows a couple times a year. Regardless of the hypocritical name, I can’t blame the organizers for rescheduling. As I heard it, the reason the wonderful Night Ride no longer occurs is someone went off the path in the dark and got hurt, prompting litigation. Can’t have someone slipping on the ice and then putting the WDOTYR out of business with a lawsuit. (And can’t blame them for filing a suit, since the way private health insurance works is they won’t cover injuries if they think someone else can be sued for it. Don’t blame lawyers for our litigious society, blame insurance companies). More or less what I said w/ some elaboration, but thanks and I agree. If I were still in town, I’d be trying to organize a ride on the original date. Of course the route and other highlights would likely be different. But, alas, I’m still in China. Have a fun and safe ride out there. It’s called the Worst day of the year ride, Not the “WORSEST” day of the year ride….git it!